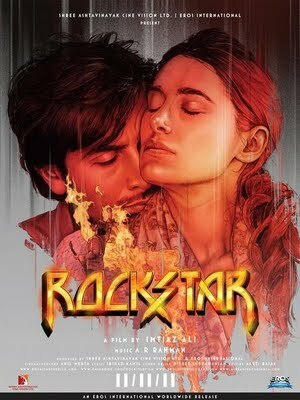 Dear folks, Those who has not seen “Rockstar” yet, please don’t read the article. Those who don’t complain about ending, probably because they paid more attention to the movie, this article is a waste of time for you. Many people will find this post amateur probably because they have understood the movie very well. Guys, please don’t read ahead, this article is not for you. This post is for my friends who could not pay attention to the movie due to incoming calls (pun intended), or those who missed the movie due to late arrival post interval. Some people left cinema halls even before the ending; this article is my dedication for them. This is the first time I am writing two articles for a single movie, so it is palpable that I really love this movie. The movie according to me is the greatest love storytelling in recent times in Bollywood. Most of the Bollywood movies nowadays have adapted screenplay from Tollywood movies, most of them have a predictable start, interval and more importantly the end. But Rockstar is far beyond the conventional movie making. The story begins with Ranbir escaping Prague Police and somehow managing to perform at the show. But that’s not the beginning neither the end. The movie begins when we see Ranbir singing Jo Bhi Main for girls waiting at the bus stand. And the movie progresses in continuation till he departs from Nargis in Kashmir. In mean time we see that Aditi Rao Hydari is personally interested in Jordan’s character and she interviews some people who seem close to Ranbir but, are not. Then she interviews Kumud Mishra. Here is when the next flashback part of the movie begins where we see that Ranbir was thrown out of his home and he lived in a Dargah and the story continues till he is seen publishing his first music on recommendation of Shammi Kapoor. hen, Kumud Mishra fixes the interview of Ranbir with Aditi (In a short flashback, we see the row between Ranbir and Piyush Mishra where Ranbir mocks over Mishra’s advices) and the story moves on without any more flashbacks, Ranbir now heads to Prague and reunites with Nargis. After Interval the story moves straight without any flashbacks till the point where Nargis, is diagnosed to have bone marrow. Now heading towards the ending…. We see that Nargis is in coma and her condition has worsened. Then her younger sister calls Ranbir as she wants to confirm if Nargis is pregnant. Ranbir is soon to perform at the concert but as soon as he receives the phone, he leaves the concert and goes straight to meet Nargis. Meanwhile, we see a flashback where we shockingly realize that Nargis is pregnant. In ICU, Ranbir realizes that Nargis has stopped responding (she doesn’t kiss back Ranbir, obviously, she is in coma :-P). This is when Ranbir realizes that Nargis will die soon. Ranbir then surrenders to cops. He is bailed from Patiala Court and he does his "middle finger act". He saw this thing done by Jim Morrison, and now he realizes why JM did so. Ranbir sings Nadaan Parinday in a hope that Nargis’ condition will improve and they both will reunite (lyrics are haunting BTW!) meanwhile, Ranbir feels that Nargis is with him on the stage, but she is not. The end credit rolls as soon as we see Ranbir and Nargis superficially together on the stage. The ending suggests that Nargis has died in coma and the naive falcon (Nadaan Parinda- Nargis) has returned home (reunited with Ranbir, not in physical way, probably her soul is now omnipresent with Ranbir). The abrupt end at this point indicates that Love is eternal. It needs great guts to present a simple but effective love story in a different way. It needs more guts to convey the poignant ending in a positive way. You did it, and did it very convincingly. I absolutely loved the way screenplay is written. Those who complain that the movie is dragged in second half, I disagree with you. This is the time when we see pure passion amidst the lovers (Aur Ho song is poetically describing the love at its passionate best). This is the time where the viewer is allowed to gulp in the quick storyline that covers a span of almost a decade in hundred minutes. To those, who complain that there was no emotional attachment with the story, my heartily condolence to them! UPDATE: Article edited and thanks to Mitesh Saraf and AJ Rox for pointing out goofs. I felt connected and really I found it a beautiful love story. The end part where ranbir recalls the incident of the two together(where they made love to each other & she became pregnant) shows that it was nargis not ranbir who was persuading ranbir to make love. It shows that despite everyone blaming him for putting nargis life in misery.It was not his fault as he didn't knew anything about complications. However, it is not clearly shown why she wants to kill herself whether it was bcoz she felt that their love was just not making her life & but also jordan's life miserable too. do comment if you liked it. but the conclusion remains that they want to live in another world, without society, pressure and other hurdles in their love...this can, in some way be connected to the dialogue that Ranbir says in the beginning, "sahi aur galat se door ek maidan hai, main wahan milunga tujhe"
Rockstar is one of the finest and gutsy movie till date in Bollywood, Inception was one of those Hollywood flicks. As far as the Climax, My dear, The Nadaan Parindey concert is held long after he leaves Nargis in coma, Ranbir can't grow beard and hair in just a span of 1 or 2 days. It's a journey that he embarks on and the song "Tum Ho" justifies everything and if one hears the song with all ears, one can very well connect the dots and understand what Imtiaz Ali was tryng to portray! People who didn't liked the movie, better go watch flicks like Ready and Bodyguard..
Make way, Bollywood is changing! this is another kickass movie by imtiaz ali!my interpretation would be tht he(ranbir) is so obsessed with his love, in fact he himself shatters his love by impregnating nargis! @himanshu- rest i totally agree with u on the nadaan parindey part. and i didn't feel at all tht the movie was dragged! Even inception had an open ending, but because it was a hollywood flick there are lots of articles explaining the 3 possible ends. Unfortunately, it's not the case with Rockstar, as this is the only article I found so far that discusses it's ending, and even it has a few factual errors...but really appreciate the author, for being the first to do this...hope more articles surface by, and would love if Imtiaz comments something about it. BTW, the first movie after 3 idiots which has amazing Re-play value...watched it 3 times already. AJ - Rox: Went for second time today, after I realised that I goofed up at some places , thanks to you and Mitesh. And yes, I agree with the point that concert was held much later. And Heer is dead for sure AJ. 2)It is clearly shown in Nadaan Parindey that Ranbir is the only one that feels the presence of Nargis, and she is not on the stage. Mitesh: Thanks for pointing out man. and yes even wordings of Tum Ko poetically conveys that Heer is no more physically..
BTW, no one is talking about Aditi Rao Hydari, her role was very strong. And later she fell in love with him..or atleast got infatuated towards Ranbir..
And finally it touches the highest note when Ranbir finds out that Heer is in coma (technically the farthest away from him now), he even beats up the policeman due to this level of anger. And yeah, Aditi Rao Hydari was HOTTT!!! Never saw her before in any movie, even though she has been in a lot of them. Might be that she was in love with Ranbir, or just his story. Ladies tend to have an attraction towards men with tragic love stories (take the movie "Sleepless in Seattle" for instance), so maybe that made him attracted towards Ranbir, or maybe she was just trying to dig up interesting material. Aj Rox: You should grab a dvd of Yeh Saali Zindagi, according to me its best cult thriller of the year..as we all know..Aditi Rao Hydari came into limelight after that movie..
Will someone plz tell me what actually happened in the end? Imitiaz ji may be you can throw some light??? ^ Not possible..if the movie is actually a flashback of Ranbir, then Ranbir should be there in each and every frame of the movie, which never happens..more importantly, we never see any moment from which we can conclude that Ranbir died or at least under critical situation..so sorry..
1st i loved t movie...how does prague concert fit in t story ? why r cops behind him ther ? Hey folks..I am quite impressed by the study u people have done here..but what i feel for sure that i have a complete different view here..I just read about Jim Morrison..As far as the article said he died in the same way as its shown Ranbir sitting in the bathtub.. Moreover in the movie its shown that Ranbir never drank without nargis.. but he was drinking..it shows that he started hating her.. SO to summmarise my end.. Ranbir started hating her because she didnt tell her that her condition was that critical and everybody blamed him...he performed but was on drugs,alcohol or whatever u say..but when he performs at stage actually thats not the last part..its the time between he left the hospital and he died..he feels nargis with her but same time hated her..at last he dies of overdose of drugs..
After singing Nadaan Parindey, Ranbir feels Nargis's presence, which is actually her soul. He then remembers that Heer asked her to live in their "own" world (which is probably an afterlife world). Since Heer's soul (aatma) is free, it is confirmed that she is dead, free of her bodily form. P.S. : An autopsy was never conducted on Jim Morrison, so it's not a fact that he died from a drug overdose, infact many of Jim's close folks believe he committed suicide. @Himanshu: I think you should edit the article, and instead of paragraphs about the beginning, and the interval, you should just describe the 3-4 possible ends of the movie. Andy_Totem: Hey, IMDB Buddy! Good to see you here! At the very beginning of Nadaan Parindey, three four frames in black n white rolls in which we see that Ranbir gets tussled with cops on some issue..could not notice clearly, will observe carefully next time...and so Ranbir runs and cops are chasing him..
AJ-Rox: Thanks for idea man, let this post die, so that I collect observations from all the commentators and create an article seperately..till then, just enjoy the different interpretations here! Riya: I am glad that this post helped you..keep checking back for latest Bollywood stuff..
No post mortems. jus loved d way it strung my heart, again. and yes cried too. They show Heer breathing when the "Khayo Nato Naina More" part comes in Nadaan Parinde. It really isn't conclusive, but the last part of the song where Jordan sees Heer on the stage maybe showing that he felt her presence, and the fact that she still lives. But probably she wouldn't have got well anyway, so it will remain like that, Jordan will continue burning, and Heer will die after some time. 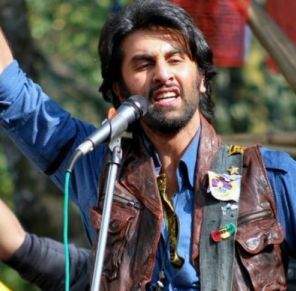 What is astounding is that an Indian movie has truly portrayed the life of a Rockstar! Salute to the movie! Oh ! Good review , feedbacks , thought provoking , movie stunned me , stirred my soul. I write only about those movies which i like.Like recently HKA & this one now. the ending of the movie was shot earlier with ranbir dying at the end. But later imtiaz decided to cancel the ending as it was not apt. The whole movie ending was reshot! nice interpretations guys but my confusion increased even more..
Aamir: Hmm ... I think we are missing the end and movie didn't end here, which shows that maybe part two of Rockstar may come in future. It feels very good to discuss the ending. I think nargis died and ranbeer heart broke. As you guys remember RaNBEER said " mera dil nahi tootna chahiye" to his manager. Rockstar bannany kay liye dil to tootna zurrori hai. 1. They didn't show her dying, but she did die but in 'Rockstar 2'. 2. I think the child was born, everyone ignored that she was pregnant. 3. The reason I said part two of the movie is because in the end Ranbeer looked much older and this part didn't fit the movie ... any-be tbis small clip was from 'Rockstar 2', just like 'The Bourne' movies. Heer gets pregnent duing ranvir visit at parague. at that time it tells that her medical report are all normal but was seeing a psychiatrist. at last heer dies and ranvir heart is ultimately broken and becomes a big star. (as suggested by his friend in order to become a big star). in 'nadaan parindey' song there is a line which makes ending very clear..."kaga re kaga re to se itni araj ke chun chun khaiyo maas, khaiyo na do naina mohe piya ke milan ki aas"...ranbir requesting crows not to eat his eyes when he dies cause he hopes that she will return someday and he will see her. ...so thats my point of view..
ranbir was fantabulously fantastic in this movie.. nobody could do it except him. Rockstar was meant for him.. It's pretty clear that both Ranbir and Nargis have died and are getting together in another world. akiavelic: Truly, I didn't expect such a wonderful performance from Ranbir! ^^ insightful. would have been great if you could have left your email ID or URL! I still can't figure out who were the guys beating Jordan in the starting of the movie & in Nadaan Parindey (Flashback).. Were they policemen, or some guards sent by Dhingra to make him 'pay', or some random folks with whom Jordan messes up, coz in start when they were beating Jordan, they seem to steal his jewellery & all from him. In nadaan parindey, you could see one frame where Jordan seems to poke them & just messing himself with all these guys..
Pls shed some light on this..
You my friend just read between the lines and said the unsaid. Only an audience like you deserve to watch a movie like this. Some say this movie was over done and shallow and absurd, rather it's way too poetic and deep. No pain no gain! Jordan NEEDS to be in pain so that he can perform. He messes up with everyone irrespective of reasons whatsoever . Pain is his oxygen. What he was up to with those guys in the beginning, and in the end before the concert? My feeling is that, he was arranging for his dose of oxygen so that he could perform. It's shown towards the end that they were playing cards and he messes up with them. Anyways... Thanks Himanshu for a wonderful article. I loved the movie more after reading this blog and the discussions. Thanks once again. Very well written. Movie is beautiful. Going on the public opinion i never thought of watching it, but when I saw it, i kept on watching it again and again. Simply great movie indeed. Great post . Loved the movie to the core , the best of Imtiaz Ali and certainly 2011's best . I think its the perfect ending to such an eternal love story , with Heer dying in the coma and Jordan left burning throughout his life . And their two souls getting together in the Meeting Place . The thing about Imtiaz Ali's movies is they grow on you after each viewing and his movies are getting better and better with the time . Socha Na Tha - Good , Jab We Met - Awesome , Love Aaj Kal - Brilliant , and Rockstar - Epic . 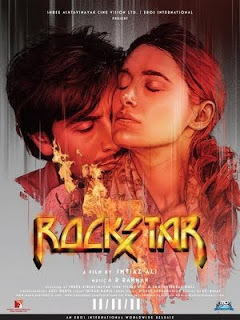 Rahman , Ranbir , Imtiaz , Irshad , Mohit - Thanks for this soulful creation , thanks for Rockstar! PS - Being a Bollywood lover , liked your blog a lot and will try to be regular here from now . the song naadan parindey in my opinion is not just about jordan wanting nargis to come back but also everyone else wanting jordan to come back when it shows the two people looking at his poster it showes in their face that they want jordan to be like himself before being filled with rage. great analysis from everyone regarding whether ranbir died at the end or not to meet his eternal love in heaven. I have one point which differ with the opinion of all people written above, as per me heer never gets pregnant and the cause of her getting into coma is only because ranbir is not beside her and the illness has taken its toll on her. Even in the scene under the bedsheet, the director never shows that they both made love and leaves it to viewers to speculate what happened. Even heer's mom, sister and doctor are not sure whether she is pregnant and there is no scene in the film which confirms heer is in coma only bcoz of pregnancy..
My opinion is that director wants to say Heer might have died earlier if jordan had not come to her again which inspired her to live again and in the process she gets better but even the doctor says that she is only looking better outside and her illness has not been cured and will surely die but may take some more time.. so even heer is not pregnant she would have gone to coma with her illness alone (not by making love) and jordan feels very bad bcoz he feels he should not have let her go from his sight as when he is around heer is fine with her health and could nt digest the fact that she went into coma eventually dying..
this is my opinion and would be glad to see how u guys respond to it..
Heer is pregnant for sure, otherwise she was recovering very fast and she was looking pleasant and was recovering from illness too! (Miracle, as they say in Bollywood movies). But then she gets down to coma suddenly, and that indicates that something is wrong with her, she can't go to coma just like that, sooner we realize that she is pregnant. And at last whn he was singing naadan parindey a girl was looking at her poster whm does tht suggest ?? Ranbir remains annoyed due to people and media all around him...moreover, he has even lost touch with Heer at that time..he wants his life to be lived the way he loves..thats why he sings sadda haq which in a way, means that freedom is his right, and he deserves it..
By those lines in which he mentions about "parindon ka jhoond" , I think he is looking for his lost happiness; here those happy birds signify his state of happiness, which is now missing. Thank you for providing the best information for all of us. You can visit my blog for movie review by all the bollywood critics and Very nice blog. oh my god!! !what a nice music!!! !i like it!